First chanted outside the Libyan Embassy in Damascus in February 2011, and later repeated as a message to Syrian security forces who were shooting at unarmed protesters, this was one of the first slogans of the Syrian revolution against President Bashar al-Assad. 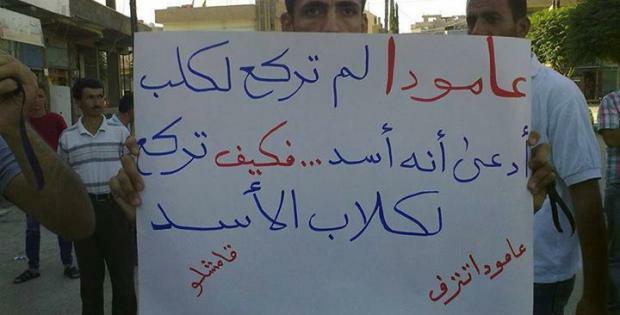 Now, Kurdish Syrians in the city of Amuda in northeastern Syria are using the slogan once again; this time against the Democratic Union Party (PYD), which is the political wing of the Kurdistan Workers’ Party (PKK). Throughout the Syrian revolution, the PYD has been accused of collaborating with the Assad regime, and has helped the regime silence the voices of members of the opposition, including the renowned Kurdish opposition figure Mashaal Tammo, who was shot dead early in the revolution. It was not only Amuda’s activists who protested the PYD’s actions. 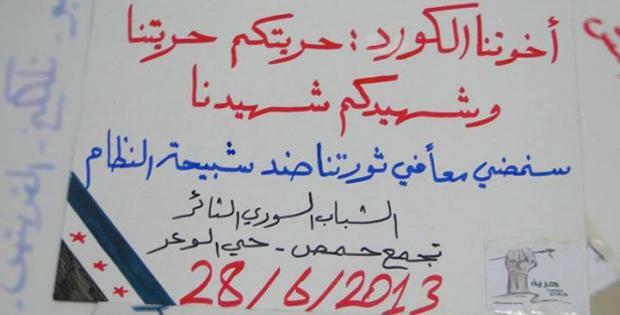 One June 28, a group of intellectual Kurds in the city of Qamishli held an anti-PYD protest in front of Qasmo Mosque. PYD militias attacked the demonstrators with sticks and knives, abusing them physically and verbally. They yelled at the protesters in Kurdish, saying, “Show us how you’re going to keep demonstrating.” They also raided the house of a person they suspected of sheltering the protesters, and accused them of working for Turkish President Recep Tayyip Erdoğan. One of the city’s most renowned media activist, Farhad Ahmi, was severely beaten. 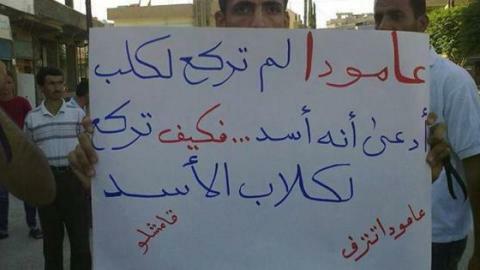 Amouda didnt kneel down to the Assad and will not kneel down to his dirty dogs. Source: Amouda online facebook page. 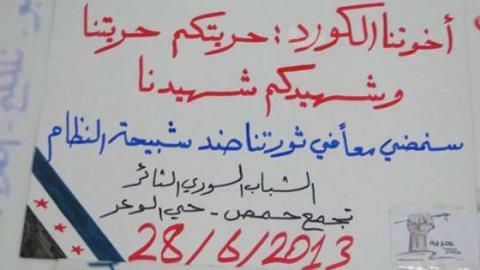 A poster from Homs supporting the Kurds against the Assad's "Shabeha". Source: The Syrian revolutionary Youth facebook page.